平常若有一般相片想印出4×6, 不是很講究品質的話, 就到Walgreen或Costco, 若是想印風景照8×12或更大張的, 我通常都是送到Mpix這一類Online Lab, 他們有不同的紙可以選, 還可以印在Canvas, 也可以作成其他成品, 如果不急著要, 通常都沒問題. 我平常拍照是很少會印出來, 就算有, 也都是送Online Lab比較多, 但是之前因為上課後常要將拍照的作品印出來, 有時候送Online Lab來不及, 而Target, Walgreen這一類的品質又不穩定, 加上我們售屋的廣告傳單有時等不及廠商印好寄來, 需要在家自行印好應急, 而我原來的HP g55 All-in-One Printer (可印, 可拷貝, 可掃描) 已經用了起碼七年以上, 做一般的文字列印和文件拷貝都可以應付, 所以對於平常我要印作業和資料沒問題, 但是我開始發現掃描的功能開始出狀況, 時好時壞, 而且不適合做彩色照片的Printing, 因為顏色不夠細膩, 所以讓我想買一台可印相片的全功能 Printer. 我看好幾款Photo All-in-One Printer的Reviews, 最後決定買 Epson Stylus Photo RX680 All-in-One Printer, 因為多數使用者的評價很好, 不但可以掃描, 具有自動雙面列印功能 (我最愛的功能, 因為省紙), 還可以直接印在Printable CDs/DVDs, 印相片的品質也很受好評 (可印4×6 到 8×11), 而且不到二百塊. 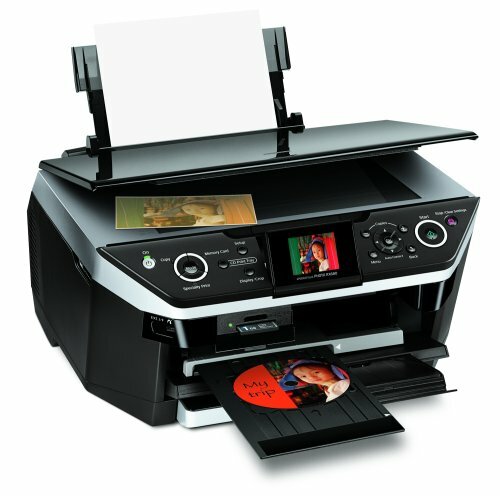 網上比價結果發現, Epson的網站上經過六十塊Rebate是最便宜的 ($109.99 + 運費), 但是當時缺貨, 而Amazon上的價錢是 $177 + $30 shipping, 所以我再上Ebay看看有多少人在賣這款 Printer, 結果發現Ebay的價錢都比Epson的官網要貴, 但有些比Amazon略低一點, 所以我後來分別寫email給五位不同Ebay賣家, 問問他們願不願意接受講價, 後來有一位賣家願意以$135 (含運費) 賣我, 於是成交 (還好有買到, 因為後來Epson官網恢復正常供貨時, 價格也恢復原價$169.99 + 運費). 收到貨後趕緊開箱檢查, 然後安裝試印. 它的體積和我舊的 HP g55 差不多, 不過全黑的外型比灰色的要現代摩登, 而六支墨水併起來的體積比 HP g55要小, 所以墨水和列印的比例上, 應該要有效率多吧. 它有前後二個送紙區, 方便你在這二區放不同的紙, 而不需要一直替換. RX680的一般黑白文字列印的速度比 HP g55 快很多, 掃描的品質超清晰 (如果原文的紙質過薄, 會連背面透過的字影都掃起來), 而相片品質則和紙張的不同, 以及列印的選擇有關 (還有印反字或反圖的Mirror Image可選), 如果選品質, 那相片印的速度就會慢些, 也比較吃墨水. 它另外的功能還包括可直接將USB或相機的記憶卡直接插入, 挑選相片列印. 印表機本身也提供幾項簡單的相片調整功能, 包括 View, select, crop, rotate and enlarge with 2.5" tilt LCD; Restore old, faded color photos; Scan to PDF for e-mailing or archiving. Is it wireless? I love wireless printers! By the way, I think you have to use this kind of printer on a regular basis in order to keep it running smoothing, right? I’ve heard if you don’t use this kind of printer often enough, the inks will need cleaning or such. have fun with your new printer.